, Labour Party activists and lots of interesting people who I follow to help to collect ideas for this blog. I’d strongly recommend that people go next year, and take some time to go back through the #NetrootsUK tag on twitter for a flavour of the discussion. I came away with lots of reflections and a very long Evernote to go back and read, but here are 8 things that struck me immediately . 1 – We need to find self-replicating models for our campaigning. Paul Mason in a great overview of the UK campaigning sector described UK Uncut as a group that had changed the agenda. Why? Because companies quickly became terrified of their branches being taken over, and that the model quickly grew from one action in London to many across the country, including involving many people who couldn’t immediately be identified as part of a radical movement. Dani Paffard from UK Uncut on the same panel spoke on how they’d found the tactics they’d used to sustain media interest for much longer than they expected, and that it was a template that could easily be replicated. 2 – Training Matters– In the same seminar, Paul Mason identified on of the critical groups behind UK Uncut and the Occupy movement in the UK as those who’d attended and be trained at Climate Camp. They were he suggested ‘uber-activists + committed horizontalists who knew what to do’. Adam Ramsay spoken of how many of those involved had been part of People and Planet as students and identified that as an important training ground, and suggested that while specific campaigns are like flowers that bloom from time to time, we need to invest in the roots that sustain them. 3 – We should be interested in who owns the internet – This wasn’t something that I’d spent much time thinking or indeed worrying about until last week, but hearing Sue Marsh from the Spartacus campaign speak about how they’d found blogs and chat rooms blocked during their campaigning on the impact of austerity on disabled people, you realise how important it is to make sure you have access to the tools you need to get out your message or organise your strategy. 4 – Parody Works – Jenny Ricks from Action Aid shared how they’d used parody to highlight the practices of Tesco and SAB Miller (makers of beer like Grolsch). Jenny suggested that parody has become much more popular because of the web, as it much easier to share and can be helpful in helping to shift a broader debate, in the case of Action Aid on tax dodging. She reminded us of the importance of ensuring significant research is available to back up the claims that are being made. Need to make the most of moments. There is a thirst for personal connection even in digital campaigning. That relationships are long-term things to invest in. That online campaigning needs to drive offline activity. 6 – FoI is still a campaigning goldmine – Freedom of Information campaigner, Chris Coltrane reminded us of how easy at tool it is to use, and also that if you get told your request can’t be looked at because it costs too much money to always ask how they’ve made that calculation. My tips on using Freedom of Information are here. 7 – Presentation matters – The team from Who Funds You shared about their work looking at the transparency of UK think tanks, an important but potentially dry subject. However the front page of the site is a brilliant example of how to display the findings without hiding them in a press release. Karin Christiansen who’s behind the work also shared the following tips for anyone working on transparency issues suggested monitoring and ranking is the only way to get attention. 8 – We need to get out of our bubble – One of the final presenters, was Karina Brisby from the VOICE blogging project. She shared about how the project was set up to give voice to new people to share their perspectives on G20 and climate change summits, but also to ensure that the issues were communicated to those ‘outside the bubble’ by inviting bloggers to get involved who had diverse and different audiences. 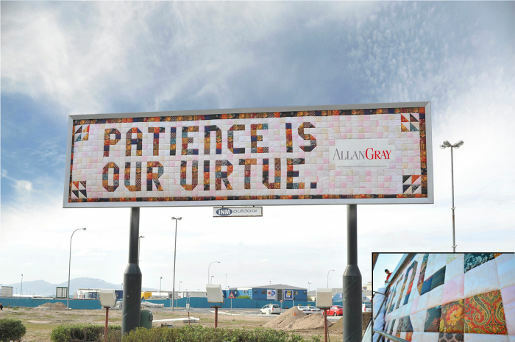 We’re told that patience is a virtue, but if we’re honest with ourselves it’s not one that’s always found in abundance within the campaigning world. As campaigners we’re paid to be impatient people, we want things to change now. But a recent conversation with a colleague who’d been involved in the start of the Australian anti-smoking campaign over 20 years ago reminded me that some times our campaigns are going to take years, even decades to win rather than the weeks we’d like it to! My colleague was celebrating because just the week before the conversation the Australian government had announced another victory for the campaign, that packets of cigarettes would no longer be able to be sold with any branding on them, a step that advocates on the issue believed would help to reduce sales of cigarettes to minor, another important step in the campaign to reduce the public health impacts of cigarette smoking. It was a good challenge, as it raised questions for me about how we plan our campaigns for the long-haul. Here are a few thoughts about what we can do, if we subscribe to the belief that sometimes change will be a ‘long time coming’! 1 – Be clear about the steps on the journey to success – I often come across campaigns that are quick to announce their ultimate goal, but are less clear about the journey that they’re going to need to go on to get to it. How much time in our planning do we map out the potential steps that we might need to take on that journey, the policy wins, the changed attitudes or the key individuals that we need to bring on board to be successful. These interim goals are as important to identify as the final goal. When we do this do we need to do more to communicate our anticipated story to our supporters and donors to give them a sense that we’re on the right trajectory as opposed to demotivating them when the final goal doesn’t feel likes it coming around as quickly as we’d like? 2 – Consider the ‘What If’s’ – Do we spend too much time thinking about a simple and clean liner path to success in our campaigning. We assume that we’ll be successful every step of the way along, but sometimes that doesn’t happen, we find that a target is immovable, or the argument that we’re using isn’t getting the traction that it needs, but how often in our planning do we ask ‘what if’ and come up with multiple options towards eventual victory, anticipating when we might need to shift our plans. The excellent paper ‘The Elusive Craft of Evaluating Advocacy‘ has lots of more on the importance of this approach in successful campaigns. 3 – Communicating our ‘signs of transformation’ – We often have stories to share that help to prove that we’re heading in the right direction. Where I work we’re encouraged to capture and communicate our ‘signs of transformations’ to staff and support, these are the tip bits that we pick up in conversation with policy makers, politicians or others that help to justify our decisions. In the long battles for success capturing and celebrating the small victories become important both to those working on the campaign but also those supporting it. 4 – Holding something back – Thinking back to the experience of Make Poverty History, and perhaps to a lesser extent the climate campaigning ahead of Copenhagen, one of the biggest challenges that I observed was that after the main moment their were few people around to keep the campaign going. During Make Poverty History everyone became so fixated on the G8 meeting in July that their were few people around to keep the campaign going for the second six months of 2005. I’m increasingly convinced that campaigns need to be developing a ‘bench’ of experienced campaigners who can come in to keep the momentum going after these key moments. For those leading campaigns that are going to take time to ‘win’ we need to consider what we have in reserve. What lessons have you learn’t about campaigning for the ‘long haul’? Last weekend’s Financial Times has a wonderful article about Canvas (the Centre for Applied NonViolent Strategies), a Serbian organisation that trains activists around the world in how to successfully overthrow a dictatorship. Formed by a group of students who were involved in the overthrow of the Serbian Dicator, Slobodan Milosovic, in 2000, the group has gone on to train activists in Egypt, Zimbabwe and Burma. Like many I was aware of the role that students had played in the campaign back at the start of the century, but the article shares not only the tactics they used then but sheds lots of insight into the legacy of this work. The article can be read in full here and I’d recommend it. The five tips that the article outlines about ‘HOW TO TOPPLE A DICTATOR PEACEFULLY’ also serve as good reminder about core principles for anyone involved in campaigning, even if you’re not trying to topple a dictator! Analyse the problem, identify and agree a clear vision, build and maintain a strong team, with perhaps the exception of tip 4 which isn’t a risk in most campaigns in the UK. 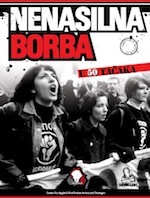 I’d also recommend having a look around the Canvas website for some interesting resources, including Nonviolent Struggle – 50 Crucial Points (reviewed here) which is a primer that drew on the lessons of the revolution in Serbia and this set of resources about recruiting and building a team of activists. Yesterday, the European Council adopted a regulation that will allow the ‘European Citizens Initiative’ to go ahead from early 2012. 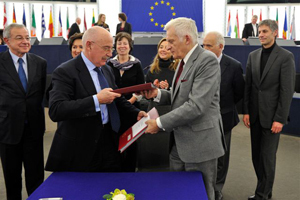 A key part of the Lisbon Treaty, the initiative allows a group of citizen to bring legislative proposals to the European Commission, providing they can gain the support of a million other Europeans. The initiative allows any group of citizens the opportunity to directly approach the European Commission with a proposal for a legal act of the Union. To do this you need to get a million (verifiable) signatures within 12 months from at least 7 member states (and achieve thresholds in each of these countries). Then the initiative will then get considered by the Commission who may or may not act on it and provide you an opportunity for a Public Hearing at the European Parliament. I have my doubts about the impact that this will have. It’s a nice idea but the opportunities that it really affords to influence or change EU law if you can collect 1 million signatures seem weak. I’ll leave it to readers of the blog to suggest if they think it’s an effective campaigning method or not. The initiative in theory affords citizens the same rights as members of the European Parliament and Council to submit proposals for legal acts of the Union. Organisers need to get signatures (known as statements of support) from citizens in at least one-quarter of Member States – so 7 at present. Plus achieve a minimum number from each of these states, which is equal to 750 signatures per MEP from the member state. So you only need to get 4,500 Estonians to agree with you (by virtue of having 6 MEPs) but you’ll need 74,250 Germans to agree with you (because the country has 99 MEPs). It needs to be organised by a ‘Citizens Committee’ comprised of individuals from at least 7 member states. Text needs to be submitted in advance (in any official language) for approval by the Commission who will give this within 2 months. The Commission will also run a website that will hold a register of all valid initiatives. The Commission can reject it if they feel that the initiative does not propose a ‘legal act of the Union‘, is ‘manifestly abusive, frivolous or vexatious‘, or ‘is contrary to the values of the Union‘. Citizens of Belgium, Denmark, Germany, Estonia, Ireland, Netherlands, Slovakia, Finland and UK won’t need to provide a valid ID number as part of signing. Citizens of other states will. The organisers of the initiative need to be transparent about any sources of funding they are receiving to promote the petition. Statements of support (names on the petition) need to be collected within 12 months of the initiative being approved by the Commission. Names can be collected on-line and the Commission will provide open-source software to facilitate this. When the target has been reached, the names will need to be submitted to the relevant authority within the a Member State for the purpose of verification. This has to be completed within 3 months and comes at no cost to the organisers. The initiative should then be submitted to the Commission accompanied by the relevant paperwork. The amount spent in support of the initiative needs to be declared to the Commission when it is submitted, and must not be any more than the limits set down for political parties. The Commission will receive the initiative, meeting with representatives of the initiative at a ‘appropriate level’ and will set out its political and legal conclusions within 3 months, including the action it will/won’t take. After this has happened the organisers of the petition will have the opportunity to present the initiative to a public meeting, organised by the European Parliament, where a representative of the Commission will attend. The idea will be reviewed every 3 years. The rest of the document covers the way that the regulation will be implemented in Member States, some issues around data protection and also about delegation of powers. So when might we see the first successful initiatives? A year has been allowed for the Commission and Member States to prepare for it implementation so the first initiatives won’t be able to be submitted until March 2012 (and could take 2 months for approval, so May 2012). Then assuming it takes at least (and I reckon it’ll be much longer) 6 months to collect the required signatures (November 2012), another 3 months for Member States to verify the information (February 2013), then another 3 for the Commission to consider the initiative (May 2013), we could see the first Public Hearings happening in early Summer 2013. Is celebrity activism always bad? I’ve just put up a new post over at Political Dynamite asking if celebrity activism is always bad. Do have a read and share your thoughts.